Clear skies. Low near 40F. Winds NNW at 10 to 15 mph..
Clear skies. Low near 40F. Winds NNW at 10 to 15 mph. Nathan Forkner uses cover crops on his farm in west central Missouri. He says he’s learned through the years how to use them effectively. His first two attempts were “utter failures,” Nathan Forkner said. But he learned what didn’t work and revamped his program. The key to success lies in diversity since growing seasons vary this ensures the field is always green. The goal is to be green year-round and always have a live root in the soil. RICHARDS, Mo. — Nathan Forkner started using cover crops to help his soil retain moisture. Now, he relies on them to keep his farm productive and profitable. After three consecutive droughts in west central Missouri in the early 2000s, Forkner was ready to turn the tide. He wanted to protect his soil against the negative impulses of Mother Nature. Cover crops seemed to be the answer. His first two attempts were “utter failures,” he said. “I said I’d never do it again,” Forkner said. But he learned what didn’t work and revamped his program. 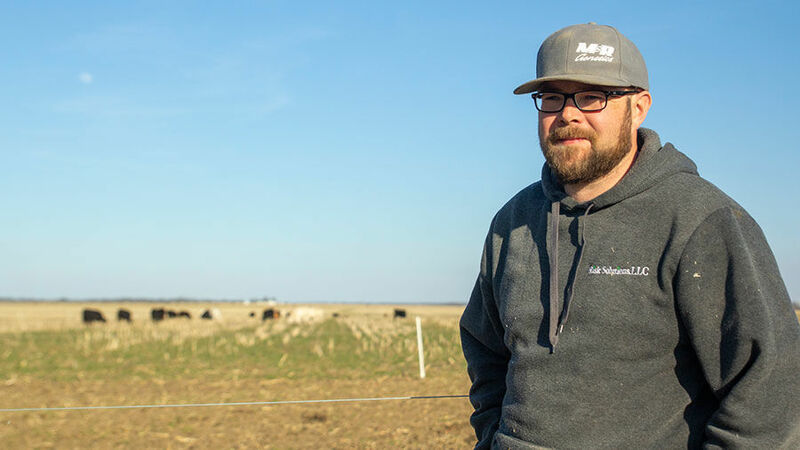 For the last seven years, he and his dad have put cover crops on nearly every acre of their Vernon County farm. “All the paths we investigated for soil health kept leading back to cover crops, so we decided we would have to figure it out,” Forkner said. Fortunately, when he tried the third time, there was more information available. “If a guy wanted to try it now, there’s a plethora of knowledge out there. There were people doing it in the early 2000s, but they weren’t getting publicized or recognized. Now it’s becoming more mainstream,” he said. The results have been astonishing, he said. Keeping a live root in the soil year-round provides continuous food to the soil organisms. Otherwise, after harvest there is nothing left to keep microbes alive and working, Forkner said. “With cover crops you keep that going,” he said. But the more noticeable improvements are weed control and water retention. “In 2012, we were losing the battle to weeds in our soybeans and needed to lower our chemical costs,” Forkner said. The covers protected the soil in the off-season and reduced the need for herbicide in the spring. Despite a drought in parts of Missouri last year, Forkner had enough water in the soil to yield a good corn crop. The healthy soil held water, and ground cover reduced evaporation. The practice helps when it does rain — even too much. “Our soil is like a sponge and until the soil is fully charged, we don’t have runoff,” Forkner said. In fact just last month, Forkner reported a 3-inch shower, yet none of his fields had standing water. “We don’t have runoff so that means no erosion. And if we do have runoff, it’s clear not muddy,” he said. The key to Forkner’s success lies in diversity, he said. Having multiple species in each field ensures something will work. “We’ve seen areas of a field that cereal rye didn’t do good in but something else took off,” he said. And since growing seasons vary, diversity ensures the field is always green. He started with a blend of ryegrass, turnips, radishes, triticale and cereal rye. Early on, he planted a three-way blend. And as the years progressed, he incorporated more varieties. “A couple summers ago, I had a 14-way mix over the summer, then I came back and planted another five-way mix,” he said. And most years, the drill pulls in the field as the combine pulls out. “The goal is to be green year-round and always have a live root in the soil,” he said. From a production standpoint, cover crops also help reduce input cost, he said. The legumes continue to add nitrogen to the soil. And brassicas capture organic and inorganic nutrients for future crop use. Forkner said he uses 50% less nitrogen compared to three years ago. “The guys that have been doing this for 30 years don’t use nitrogen at all,” he said. And retaining nutrients in the soil has reduced the need for fertilizer. 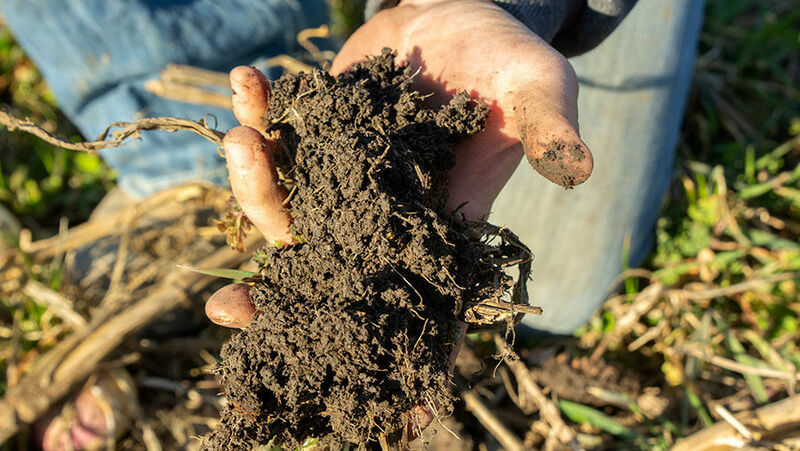 “Everything in the soil has a relationship to each other, and anytime you want to bulk a certain element, you’ve thrown off the whole relationship,” he said. Forkner said he believes the cover crops help the land maintain a natural balance. His goal is to create a healthy environment that sustains itself for years to come. And when the droughts and floods do come, his land will be able to withstand the impact. “When the soil is healthy it heals itself quicker. Mother Nature can take care of it so much quicker than we can,” he said.